Yes, this is it…I think. This is THE machine I’ve had my eye on for a few months. It’s not the fanciest or the most expensive. No flashy lights or bells or whistles. No fancy stitches or a computerized interface to connect to the internet. 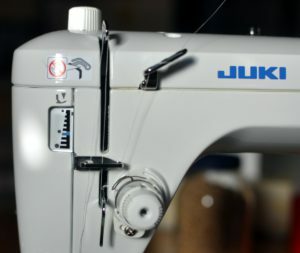 The Juki TL2000Qi sews a straight stitch forward and backward and does so in varying lengths. Period. This isn’t the newest model either. In fact, there appears to be an updated version of this same machine available with a re-designed speed control. It is, of course, more expensive and I intend to include that model in my research. That’s right, the purpose of this article is one of research – not a product review. This is an information gathering quest combined with an opinion seeking forum with the intent to help me and others like me in the same quandary make a decision. Is this THE quilting machine I should buy? Is there one I should consider that is as durable but of better value? Do I limit my options to the Juki brand or should I consider another? I’m proceeding forward very cautiously with this one because in the past I had my eye on the Juki 2010Q (and 2 or 3 others) and thought THEY were the one. However, several weeks of research and a few conversations later I realized neither of those were exactly what I was looking for. What I am certain of is this – I am in the market for a Juki…at least I am today. The sewing machine I’m now using is a Janome 2010. Not a bad machine but the paces I’m putting it through is beginning to take it’s toll. Every few days I notice a new noise, a strange rattling, increased vibration and foot pedal that clearly did not get the message that I am the one in control. It has recently decided to rebel (against overuse?) and sends power to the machine when it wants to and stops the power when it decides it wants to stop! When it comes to making any major purchase I spend a great deal of time reading, researching, ask questions, do more research, ask more questions, take a “test drive” or two and change my mind at least a half dozen times before offering my card to be swiped to make that purchase. My original budget was set at at $1,200.00 to $1,5000.00 and I felt confident I could find exactly what I want in that price range afterall, I’m only looking for a very good, semi-industrial machine that sews an accurate straight stitch. My primary tasks are piecing, binding and quilting – that’s all. The quilting machine I’m looking for is one that is solid, durable and capable of effortlessly sewing layers of varying thicknesses, even leather. I don’t want or need any aspect of a computer on this machine. A majority (approximately 75%) of my sewing consists of straight stitching with the remaining 25% free motion quilting. There are machines out there that can do everthing just shy of washing windows and serving breakfast in bed. (IF I were to locate a quilting / sewing machine that at least washed windows – no matter the price – the ranking of that machine would immediately move to the top of the list)! For a while I have had my eye on the Juki TL 2000Qi but felt it was too pricey and then a couple of weeks ago I made a most wonderous discovery. It was as if the quilt gods reached down and did a price adjustment – a 57% price drop! What! Does this mean I may actually be able to purchase this Dream Machine?!? And if so, is this the Dream Machine I’m looking for? Continue below and let’s see what dreams are made of. machine is put through when in the hands of a quilting enthusiast like myself. Choosing the sewing / quilting machine that is right for you – where functionality and price nicely meet up – is no easy task. There are as many factors to consider as there are machines on the market. Over the 40+ years I have been sewing I’ve sewn on many different brands – Singer, Brother and Janome to name a few. These machines do the job but from what I’ve read and researched, they don’t compare to the Juki brand. 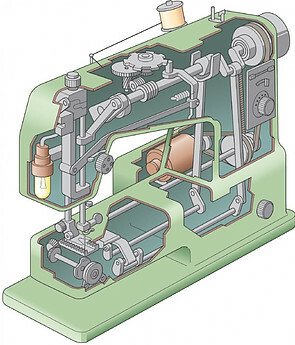 This particular machine, though marketed for domestic use, is of industrial grade and workmanship and is decribed by the company as a “semi-industrial”. The base, arm and gears are all metal. This provides overall stability and less vibration. The metal gears may create a little more noise but they do no wear out like those made from plastic. Typically, a sewing machine of this caliber would be quite heavy however, the Juki TL2000Qiis surprisingly light weight (25#) which translates into portability. I don’t intend to carry this one from place to place although I could with relative ease – it only weighs 2# more than the Janome I’m now using that I take with me everywhere. 1. 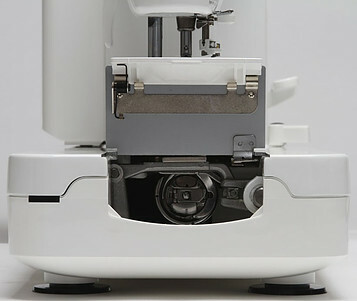 Both needle and bobbin threads can be automatically cut using the foot pedal or push of a button on the front panel. 4. Larger work area that includes a wide bed and 9″ Mid-arm to allow quilting of larger projects that otherwise would require a long arm machine. 6. Arm and bed are made of die cast aluminum. Additional information can be located on the Juki website as well as here. A girl needs more than dreams. Dreams won’t sew all those pieces of fabric together. What I do need is your honest opinion. Do you have a Juki? A TL 2000Qi? What are your experiences with it. If you own another brand how does it compare to the Juki TL 2000Qi? Feel free to leave a comment below and help me decide! “Just How Heavy Duty Are Today’s Sewing Machines?” Temecula Valley Sewing Center, 31 Dec. 2011, tv-sewingcenter.com/janome/just-how-heavy-duty-are-todays-sewing-machines. “Plastic vs Metal: Dissecting the Popular Brother CS-6000i Sewing Machine Sewing Discussion Topic @ PatternReview.com.” Sewing Patterns, Pattern Reviews and Online Sewing Classes, sewing.patternreview.com/SewingDiscussions/topic/79315. Olfa 12″ Rotating Self-Healing Rotary Mat – Is It Worth the Money? This looks like an awesome machine! Admittedly, my sewing machine is on a shelf in a closet. I REALLY want to get good at using it! I have tried several projects and I only have about a 25% success rate. I think my impatient personality has a part in this. This Juki looks like a great quilting machine. Quilting is such a beautiful and meaningful hobby, both to the quilter and the lucky receivers. I hope you get your dream machine! Thank you Holly for your thoughtful comment! Go ahead and get your machine down and just start sewing. Find an easy project to begin with like a placemat or pillow case. Once you experience success you’ll be forever hooked!